8 Best Earbuds Under $300 – Hey, Big Spender! As far as earbuds go, it looks like you are probably trying to hit the uppermost end of what’s on offer if you’re planning to buy at this price point.The premium in-ear headphones market began as something of a contradiction in terms with many brands opting to compete instead with the stock, pre-packaged models that consumers find alongside purchases of new devices. But in the last few years, a real need has emerged for high quality, versatile devices which deliver an ‘as good as it gets’ audio experience while maintaining the portability, ease of use, and all round practicality of the earbud form factor. And companies, across the board, have delivered. Ergonomic design which increases comfort during longer periods of use. Great set of drivers capable of delivering awesome sound. Active noise cancellation with Aware mode is a performance multiplier. Bose products are considered to be the pinnacle of consumer segment of the audio world. With that said, they are mostly known for their speakers and home theater solutions. Bose QuiteComfort 20 Noise Canceling Headphones are something that might catch many off guard. Ear buds themselves are pretty simple all things considered. However, the sound they offer is quite something. 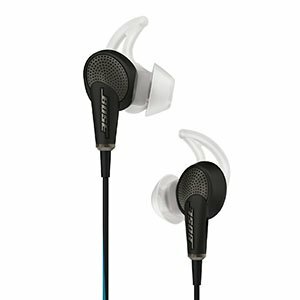 The bulk of their performance quality comes from Bose going with an active noise canceling setup. This way they’ve allowed you to completely enjoy their drivers. Here’s the thing, though. Bose QuietComfort 20 has a few more tricks up its sleeve. These also allow you to boos the environmental and hear everything around you with a press of a button. A fairly straightforward set of earbuds optimized for pure performance. Ergonomic design which vastly improves comfort as well as retention. Advanced driver design paired with passive noise cancellation does wonders. Bland and unimpressive aesthetics take away from the entire package. No list of higher end earbuds would be complete without Shure. Best known for their awesome microphones, this brand also offers some of the most impressive earbud designs on the market. Shure SE425 Sound Isolating Earphones fit that description perfectly. 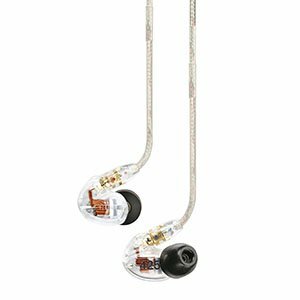 It is no secret that Shure isn’t big on aesthetics, which explains the transparent chassis and simple design on these. It is also true that rarely anyone buys earbuds just to look at them. When you put these in and play a track, you will notice a number of things. For starters that Shure’s passive noise canceling solution works pretty well. Then we have Shure’s advanced drivers which deliver a balanced, rich sound and saturation across the entire frequency range. A great design that looks good and offers good retention. One of the most interesting driver compositions currently available. Tone which offers good saturation across the entire frequency range. A truly dynamic bass signature which is guaranteed to satisfy. 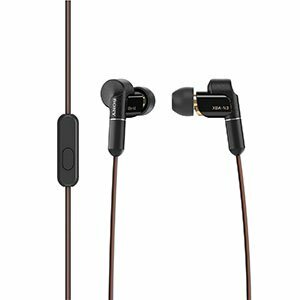 It is quite rare to see earbuds which include so many awesome engineering solutions like Klipsch XR8i In-Ear Headphones. Where most other brands are focusing more on looks than hardware, Klipsch took things in a different direction. With that said, the aesthetics on these are quite impressive aside from the conservative selection of colors. However, all of that is secondary. What really matters is the performance. 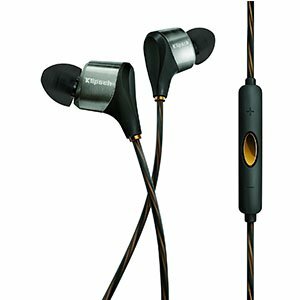 Klipsch XR8i come with not one nor two, but three drivers. You get a subwoofer unit, a dynamic mid range hybrid and a armature tweeter. That means that every part of the frequency range has a dedicated driver covering it. The moment you start using these, you will realize just how good this is. Simple yet highly ergonomic chassis design makes these very comfortable. Shure's proprietary driver technology ensures great sound across the board. Passive noise canceling technology works great without needing batteries. Great fit allows you to use Shure E2c-n while running. Shure could have included a broader set of accessories. 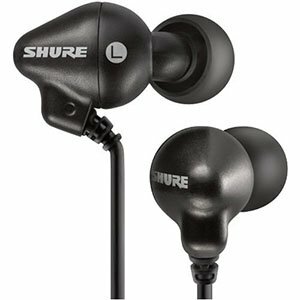 Another Shure model that has crept up on our list is the Shure E2c-n. As you can tell, these aren’t all that great to look at either. However, there is much to be revealed under the hood. At this point we can comfortably say that Shure designs and produces some of the best sleeper earbuds you can find right now. Once again the foundation of E2c-n’s performance is in their drivers and how they work in combination with Shure’s noise canceling tech. If you need something lightweight but powerful, these might be it. During use you will rarely even notice them, not to mention that they are great at minimizing fatigue. Because of all that, we find E2c-n quite awesome. Slim and very lightweight format makes these extremely comfortable. Highly modular design which allows you to change the cable. Great set of accessories which ensures good fit and comfort. Great performance with a sonic profile that fits any genre. The cable could have used a bit of reinforcement. Sony’s earbuds have been the backbone of the market for a long time. These days they’re still an authority although their focus seems the have been shifted towards more refined solutions. Sony XBA-N3AP is a great case of what we mean. These sleek, retro looking earbuds bring some much wanted solutions to the market. Especially if you prefer light earburds. Sony has chosen to go with a compact and ultra light chassis which hides a set of pretty impressive drivers. In other words, you are getting a combination of amazing performance, low profile and high comfort. The only thing that we would like to see changed is the cable. In our opinion, it needs to be reinforced in certain places. Functional yet non intrusive design which brings more comfort. Great look which has Marshall written all over it. Impressive sound quality and an abundance of power. This look may be too aggressive for some. Most Marshall products are related to guitar amps and equipment. 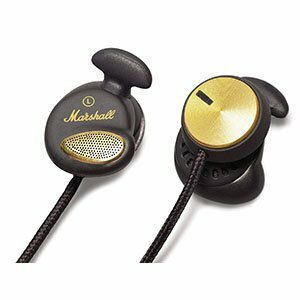 So much so that some people are caught by surprise when you show them Marshall M-ACCS-00096 earbuds. If you can get past their quirky designation and somewhat unorthodox design, these earbuds actually have a lot to offer. By looking carefully, you will see that these aren’t ear canal earbuds. Instead, these sit comfortably in your ear lobes which increases comfort without negatively affecting performance. Speaking of which, the sound you get from a pair of these is quite impressive. You are getting plenty of power and saturation across the frequency range. On top of that, these come with a built in mic, which makes them that much more functional. One of the best looking sets of earbuds in this segment. An impressive build quality and attention to detail from AKG. Effective noise canceling technology paired with great hardware. Active noise cancellation requires batteries for it to work. 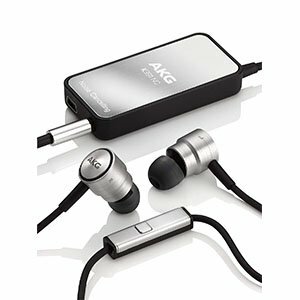 AKG’s reputation is about as solid as it gets when you are dealing with headphones. they are known for robust designs which get the job done consistently. Similar rep applies to their earbuds. AKG K391NC is a pretty upscale set that looks and feels high end, but in the end it’s still a proper AKG under all that flashy exterior. What AKG K391NC offers is extremely effective active noise cancellation, very wide sound that reaches deep down in the lows, but also has plenty of saturation to offer in mids and trebles. When you combine these two, you get a perfect music listening experience no matter how noisy your environment is. The only downside are the batteries which are necessary. Some of the best hardware solutions on the market. Great build quality all around, ensuring consistent performance. Awesome sound coming from four armatures and associated crossovers. Logitech could have definitely done better in terms of aesthetics. For some users, Logitech is probably the last brand they expect to see in this segment of the earbuds market. Yet here they are. Logitech UE 900s brings a very interesting set of features and solutions. 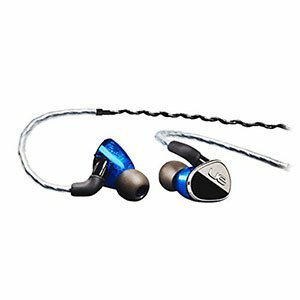 These over-the-ear earbuds pack four proprietary armatures and a 3-way crossover, meaning that you are getting a whole lot of punch for your buck. Performance wise, they are on point. However, Logitech isn’t exactly known for their advanced sense of aesthetics. These come in a blue and black finish which is topped off by a few chrome details here and there. If you can get past the looks, which honestly aren’t all that great, these can be a great set for every day use. Are $300 Earbuds Worth It? Considering the type of investment some of these earbuds require, this is a perfectly legitimate question. Not everyone can dish out this kind of money without doing a proper amount of research on the subject. Finding the answer to the question from the heading requires us to figure out a few things first. You need to ask yourself what kind of sound you deem acceptable. Whether you need absolute quality or if an average sound quality works for you? We say this because $300 earubuds are most definitely worth it, but you have to figure out if they are worth it to you. If you are an audiophile who needs something more portable and compact than a full sized headset, investing in one of these could be a good decision. Similarly, if you just travel a lot and rely on earbuds as means of entertainment, some of the models listed on above would prove to be the perfect match. Again, it all comes down to what you want from your earbuds. One thing worth mentioning is that most of these come with a some pretty advanced features. For the most part we are talking about high end driver designs, the majority of which are proprietary. Because of that, even two seemingly comparable models aren’t really comparable at all. Each brand has their own set of hardware which performs differently. Aside from drivers, one of the most interesting features you will run into is noise cancellation. Specifically, these earbuds will either have active or passive noise cancellation. Lets discuss each in detail. Active noise cancellation is easily the more efficient of the two. The levels of noise reduction some of these earbuds offer can easily silence a room full of people talking among each other. Naturally, even the best active noise canceling system has its limits. However, chances are that you won’t find those limits anytime soon. The main drawback of active noise cancellation are the batteries. Having to constantly rely on batteries can be a nuisance if you want full independence. On the other hand, being able to enjoy your favorite music with additional detail is definitely worth the extra hassle. Passive noise cancellation is simpler and less effective, but effective enough in most cases. With this approach you are using the chassis of the earbud to drown out most of the noise. As such it tends to have limited success depending on where you are and how noisy your environment is at the moment. Some of the earbuds that feature passive noise cancellation work extremely well while others not so much. The benefit of going with this setup is the fact that you don’t have to carry batteries around with you. On top of that, the earbuds themselves are going to be a fair bit lighter compared to an active set. Additionally, passive noise canceling tech tends to reduce the price of a given set of earbuds making them more affordable. Look, if you’re paying for the best, you’re probably going to get the best. It’s as simple as that. Mostly. Obviously, not everything that’s priced this highly is worthy of the price tag, but you should be sure to read as many reviews as possible to ensure that your eventual choice doesn’t disappoint. At this price range, you’re going to be able to do one of two things. Each has its use, and there’s no strictly better choice. It’s a personal thing. Either you can find a truly jack of all trades affair which delivers a solid amount of features, a good design, and decent audio quality, or you can choose which of those three aspects matters the most to you and specialize. There are, for example, a whole host of sports eardbuds, wireless offerings, or just your standard ‘general use’ earphones to choose from at the $300 price point. The world is your audio oyster, whatever that means. There are only two potential negatives worth discussing here and the main one is this: there is, no matter what brands would like you to believe, an absolute cap on the quality of an in-ear listening experience relative to other form factors. Now, this needn’t be a bad thing. Earbuds have a lot going for them: they’re highly portable, they usually come with a ton of useful features, and they tend towards a kind of plug and play, ‘it just works’ user experience that a lot of equipment designed for audio purists does not. But it’s absolutely worth considering before you drop $300 on in-ear headphones if you specifically want an in-ear rather than over-ear experience. The second negative, then, is aimed at audiophiles who, for whatever reason, have their hearts set on earbuds. At this price point, you’re going to be paying a lot of money for a form factor which can’t deliver the optimal listening experience. If audio is, above all else, your primary concern, you may want to look elsewhere. Decide which of the two archetypes you wish to pursue and run with it. Are you someone who appreciates a robust feature set, an attractive design, and a good listening experience? Then pick a pair of earphones which cover all those bases. But if you’re looking to prioritize one of the three, there’s plenty on offer for you to choose from as well. If you’re about to spend $300 on earbuds, chances are you know what you’re looking for and you know how to find it. You don’t need us to tell you that there are trade offs in terms of audio quality even at the top end of the in-ear market, but it’s important to keep this in mind nonetheless. Other than that, take your time before committing to your final choice. Remember that audio is a deeply personal experience, and try to get your hands (or ears) on a pair before buying. One person’s rich bass response is another person’s poorly defined mids.